Wood came into existence with the surprisingly rapid evolution of the Higher Plants in the Devonian. Petrified wood is one of the most common types of fossils. It comes nearly always as silicified wood, often so thorougly silicified that it can be cut and polished like chert and agate. There are no well-defined boundaries separating the fields covered by the terms fossil wood, chert, and agate. Fossil wood can be a constituent of chert, and agates can be found within chert and fossil wood. Another vague line of separation is the one between wooden and other stems. In very young calamites, wood makes a negligible fraction of the stem but it is predominating in larger specimens. The composite structure of the trunks of the big tree ferns is usually not regarded as wood but other composite trunks as those of the seed ferns are composed of separate wood strands of various sizes and shapes. In view of these facts, one should not take the subdvision into categories too seriously. Some of the present contributions could well fit into both Fossil Wood News and Permian Chert News on this website. Coniferous-type fossil wood is difficult or even impossible to assign to a certain species. It is summarized under the term Dadoxylon. With evenly dark aspect it is regarded as less interesting unless branches or the seldom preserved central pith are seen. It may become interesting in case of damage inflicted on the wood in the live or dead tree, which is not rare, and also by enigmatic patterns formed during silicification, which still give rise to wonder and misinterpretation. 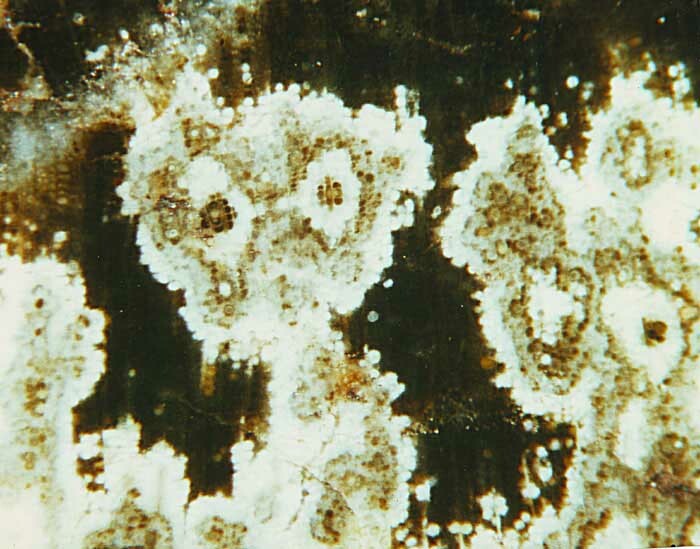 Silicified coniferous wood with conspicuous aspect resulting from differential silicification. Bleaching at much later times as a possible explanation proposed elsewhere can be ruled out by own observations on several similar samples. provided by W.+G. Etzrodt, Borxleben.